Easy to operate! Through clever design, this mount is extremely easy to operate by hand. Cables: Easily installed & Hidden in the arms. Picture Frames: Select from multiple options or install your own. Artwork: Just like a standard picture frame you can easily install any artwork you like. This mount extends your TV out from the wall above your bed's headboard so you can watch TV comfortably while lying down or sitting up in bed. Closing flat against the wall your television will be completely hidden. The arms of the mount are designed to conceal the cables that connect to your TV. You can easily install these cables yourself. When you’re not watching TV, simply close the mount to completely hide your TV behind the attached picture frame. Introduced in 2010, our manually operated Extended Flip-Out has proven itself against the test of time. Our first customers still use theirs today! In 2012 we received an INNOVATION AWARD at CES for this product, and in 2014 we received patent approval! September 2017, automated version now available! There are 12 mounting slots spaced at 16", 24", and 32" spacing to correspond with standard stud walls. The product comes with lag bolts meant for fastening to wood studs. However, with the use of appropriate fasteners, you can also attach this product to metal studs, concrete, or block. It is best to contact us for more info regarding alternative structures. This product CANNOT be installed using drywall anchors. These mounts are adjustable to fit different size TVs without affecting the Artwork/Picture frame size. You'll need to refer to the Maximum TV Dimensions for specifics, but in general, here's what to consider. 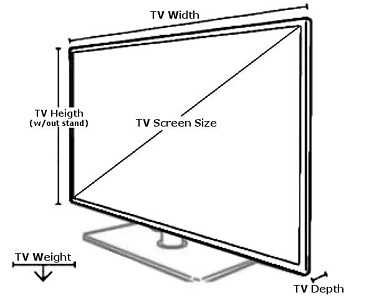 Most TVs fit within the height & width requirement. However, TVs vary significantly in depth (thickness), so it is the first dimension you should consider when choosing a TV. The maximum TV depth is also affected by the picture frame you choose. Feel free to contact us to verify a TV fit. We recommend choosing a TV after you've received your mount. This way you will have a better understanding of how the TV fits inside the mount. You can fit up to 6 cables in total (3 in each arm). Cables are easily installed inside channels along both arms. There are cutouts along the top edge of the wall mount bracket for cable access to the wall. Where to put your cable box & DVD player? There are multiple ways to facilitate this. It's easier explained over the phone. Give us a call. Through years of careful design and testing, we developed this patented design that counter-balances the TV's weight through a system of linkages making it easy to open and close by hand and incredibly strong, rigid, and reliable. This product will stand the test of time. Ask about our FREE EXTENDED WARRANTY promotion!!! Currently, we are offering a free extended warranty in exchange for pictures and video of your completed project. Try it for 60-days! If you don't like it, return it. 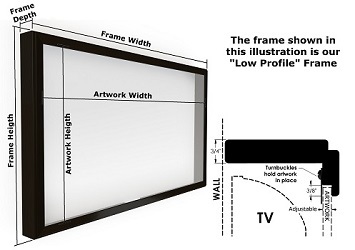 The Flip-Around mounts are designed to fit various sizes of TVs (see the maximum dimensions specified below). If you have any questions or if your TV falls outside these dimensions, please feel free to call 1-208-287-8882, click the Live Help box in the lower right corner of your screen, or send us an email. M1-32-5 LOW PROFILE up to 32 31.0 20.4 3.5 30 lbs. M1-43-5 LOW PROFILE up to 43 38.4 22.75 3.5 30 lbs. Within the “Shop Product” tab you will find the “Artwork or Mirror” category where you can choose from our images or upload your own!! We will send you a high-quality canvas print stretched over a rigid board sized to fit your picture frame. Your artwork is coated with a UV protective Coating and the back is finished with a black cover. For additional artwork options, you can also visit www.mycamera2canvas.com where you can choose from over 6,700 images. 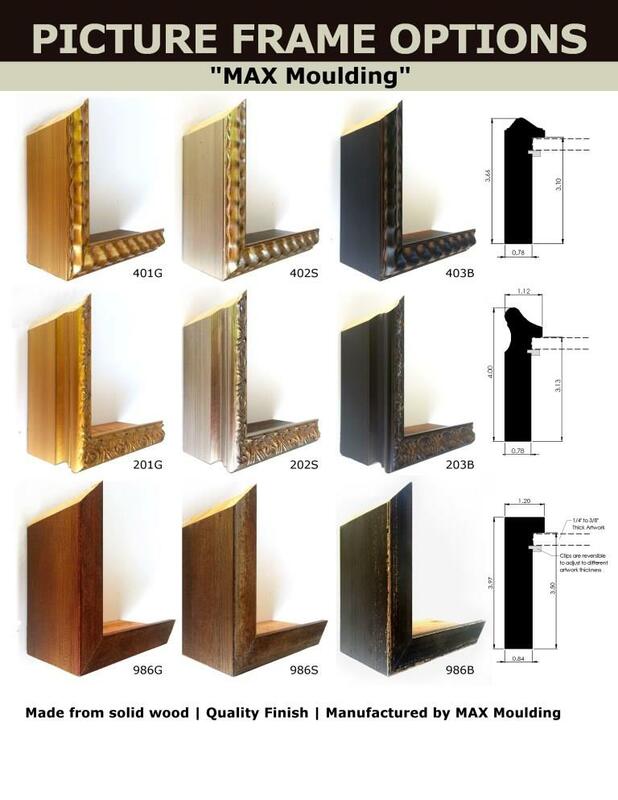 MAX Mouldings are our high-end line of mouldings. They are solid wood and offer a variety of styles and finishes. This is a simple and modern frame design that we manufacture here in Boise, Idaho. It's a great looking frame for a good price. 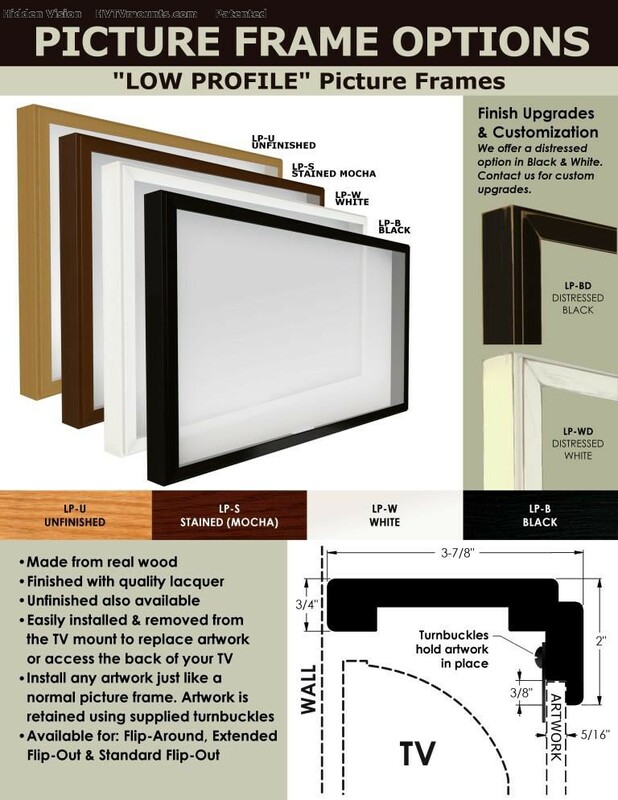 Available in Popular material and sold as an Unfinished LP frame or Extender frames. The frame is ready for you to give it a personal look. This option allows you to install a thicker TV. The tapered design helps conceal the added depth of the picture frame. 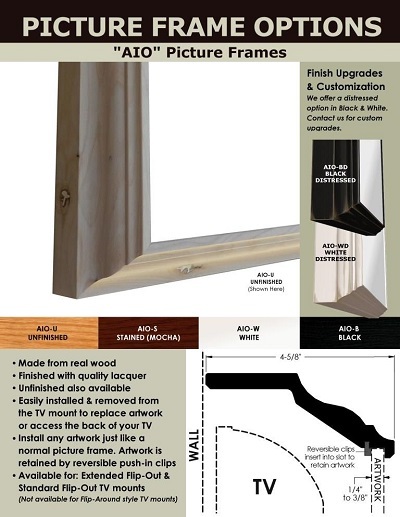 This option allows you to install any style picture frame you want. Once you receive the TV mount, give the Shadowbox Extender to your Framer, and they will attach any frame you choose. Select the No Frame option if you'd like to recess this mount into a wall or build your own frame around it. If you need guidance feel free to contact us. * The outside dimensions of your picture frame may vary +/- 1/8" due to varied moulding thickness. Contact us for more information.